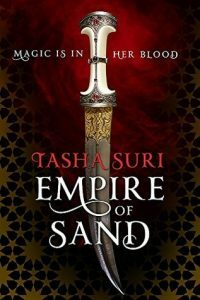 When I got an email from the publicist asking me if I wanted to review Empire of Sand, along with some information about it comparing it to City of Brass, I was instantly excited. I really love fantasy stories inspired by other cultures, and if you do too then this is one to take a serious look at! My full review below will remain spoiler-free but in short, I can’t wait for more of this world (side note – the cover is also gorgeous). ‘A nobleman’s daughter with magic in her blood. An empire built on the dreams of enslaved gods. 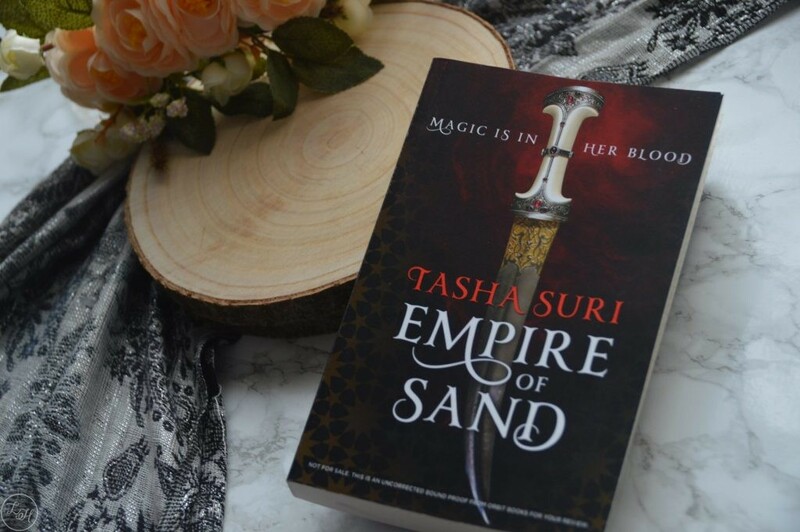 Empire of Sand is Tasha Suri’s captivating, Mughal India-inspired debut fantasy. First off, I really loved the story in general. The main character, Mehr–who the story’s perspective is mostly from–is the daughter of an Ambhan nobleman (who’s heritage puts him in good standing) and a woman who is from a background that’s essentially been banned – Amrithi. Those who are Amrithi have magic in their blood but the majority of the world created has been led to believe that this isn’t true, whereas Mehr comes from a part of it which is pretty superstitious but looks down on the Amrithi anyway. The magic system is highly linked to religion – the Amrithi are believed to be descendants of the Gods, leading them to have slight control over other descendants which are called Daiva. (They have an ancient agreement which they occasionally need reminding of through Amrithi bloodletting.) A little more about this group – they worship through ritualistic dances which are beautifully described throughout and the majority of clans live nomadic lives in the desert. In terms of characters, Mehr was strong in mind and pretty stubborn, and when she basically has her life turned upside down this leads to her being so stubborn that she keeps her hope even through some terrible events. With her being half-Ambhan and half-Amrithi, this leads to her being a complex character in terms of identity, and I really enjoyed her development from being unsure and cautious to finding her purpose essentially. The character of Amun played the love interest in the story, and he is seriously swoon-worthy! If you told me to pick a book boyfriend, he’d be mine. From the very beginning he protects Mehr but he’s grown up under horrible circumstances, which leads others in the book to only see him as a monster. This then leads to Mehr being the only person he shows his real side to and the relationship is just so real. It’s one of those slow burning romances which becomes more and more adorable throughout and just… I’d quite happily read a book just filled with their relationship. It wouldn’t even need action or drama just Mehr and Amun being cute together. Mehr originally sees Amun as another “Saltborn” – a group of Mystics who worship the Maha. I’ll get to him later but as a group the mystics are a seriously interesting set of characters. Tasha writes the group really well by having a few who are key and we see just enough of them to know whether to like or dislike them without feeling overburdened with too many characters. Another thing I really liked about the group goes back to the protagonist, as Mehr doesn’t just disregard the Mystics as horrible or anything but instead sees things through their eyes as much as possible. With some of the events it would have been easy for Tasha to have Mehr stay away from all and not see any good in them, but having her emphasise with the group aided with her character development even further. Now the Maha is absolutely terrifying. He’s such a well written villain with a history that makes him all the more intriguing. His scenes are where the book is at it’s darkest too as he thrives on people worshipping him and if they don’t, like Mehr, he makes them afraid of him to break them. With Mehr being such a likeable main character, I really found myself scared for her whenever it was mentioned that she was to see him. There were a couple of other perspectives in the book also, which really help the reader to see what else is happening. At first the perspectives seem very random, but it’s once you read on you find it puts more pieces of the puzzle together and this really helped with my overall enjoyment because it was nice to have more of the story without realising originally. Overall, this was just such a great read. The writing was great, the characters even better, the world was unique and full of culture, and the overall story kept me gripped from start to finish. I’ll definitely be reading more of Tasha’s work in general, and I hope we see more of this world in future works!